For those with modest input requirements, this is a high quality, simple-to-use package. Easy as pie to use. High quality I/O. As portable as a mobile phone. Could Apogee's latest be the One Mac users have been waiting for? One's ease of use design will appeal to podcasters and interviewers. Apogee's collaborations with Apple are yielding some tasty fruit. Fresh from last month's rendezvous with the GiO interface, this month we find ourselves in the company of One, Apogee's latest (and simplest) audio interface to date. Featuring a single channel of high-quality audio I/O and with a similarly minimalist design feel, this could be the interface for audio-ists who need to balance only basic recording requirements with high-fidelity results. One is a USB bus-powered black box which measures only a little longer and wider than an iPhone. It features a prominent silver dial on its upper surface which doubles as an Input Gain dial for signals being recorded and a volume dial for playback signals. Due to the compact nature of the design, matching that of its older sibling the Duet, traditional audio input ports are replaced by a breakout cable - which has a bespoke connector - at the interface end and an XLR mic connector and quarter-inch jack input for instrument connections at the other. Only one of these can be used at any time. Status lights at the top of the interface show which input is active, whether 48V of phantom power are being used or, indeed, whether the external microphone options are being superseded by One's own internal microphone. This input is mounted towards the bottom of the interface's upper surface and represents the simplest way to get sound from the interface to the computer, requiring you to simply plug in the USB cable and set a gain level. 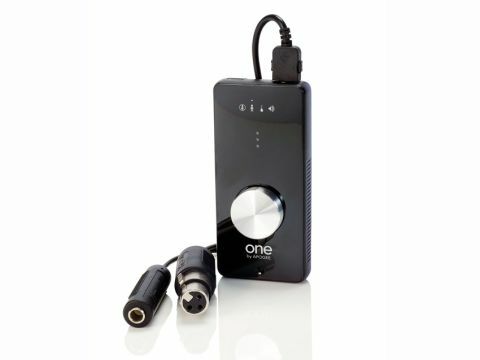 The provision of this internal mic will widen the potential appeal of One to interviewers and podcasters, among others, who'll be pleased to discover an interface which provides high-quality recording without the need to connect up external microphones. To configure audio connections, One's installer bundles the Maestro software (ostensibly a control panel) which toggles between external and internal inputs, lets you switch phantom power on/off and keeps you in control of all things I/O. The CD installer requires Mac OS X 10.5.7, so if you're running Snow Leopard you'll need to download a driver from Apogee's site. Our only gripe with One is that the breakout connector to the mic/line inputs is too short. While the USB cable is of adequate length, there's a serious risk that this interface will come shooting off your desk if you've plugged in a guitar and are rocking out or if you've connected a hand-held microphone for voice-over recordings, for instance. The portability of the unit is such that you wouldn't want to find a way to pin it down but, equally, you do need to be a touch careful. Otherwise, the unit is simple to use and provides great results. The headphone port doubles as the main audio output, so you'll need to grab a 3.5mm jack to phono adaptor cable (which isn't provided in the box) if you want to plug it into speakers. So, to whom will this appeal? Well, to the thousands of laptop users who mostly need playback but would love the option to jam a guitar, keyboard or vocal part over a work in progress and, as mentioned, to podcasters and interviewers, too. As with GiO and Duet, One's ace up its sleeve is the quality of its audio signals, which are absolutely capable of pro results.